Protecting private business information is a priority at all companies. Customer data, employee data, partner related information, and documented business processes should all be safely stored, maintained, and thoroughly destroyed upon expiration to avoid accidental exposure of classified information. Document shredding is a necessary part of any solid document management program, but exactly how complex this component of your program is is up to you. Setting specific guidelines dictating which documents to shred and which to toss is an process many organizations elect to follow. 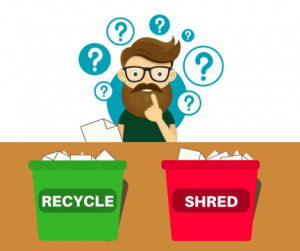 This option may seem more economical—if you pay for shredding services by the pound it’s cheaper to exclude non-sensitive files from the shredding pile and if you perform the work yourself filtering out unnecessary files can save hours every month—but this type of shredding policy can end up being a complicated, leaky nightmare. Selective shredding policies require extensive planning and monitoring, and they allow many opportunities for employee errors, mistakes, and information leaks. In comparison, shred all policies are simple, clean, and thorough. You never have to worry about a data leak because everything that is documented is eventually destroyed. A shred all policy requires less planning and organization and leaves less room for errors. Every document that reaches its expiration date is shredded without exception. 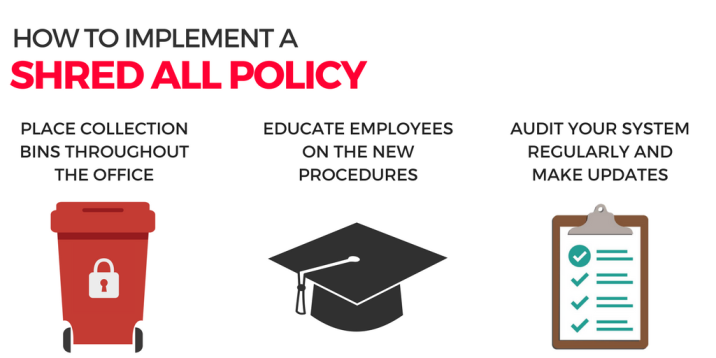 Deciding on this type of policy will streamline your document management efforts. Employees don’t have to consider whether or not shred a certain file, rules and procedures don’t have to be developed and circulated, minimal training is required, and once it’s set up the process tends to run smoothly overtime. Shredding every document unquestionably keeps your program in compliance with all federal and state information protection laws by ensuring no information falls between the cracks. When your goal is to keep your information safe, shred all policies are the clear winners because they allow no room for error and keep private information safe beyond a doubt. An important step in ensuring the safety of your private files is finding a document shredder you can trust. Shred Nations partners with certified, local shredding companies across the U.S. who have been trusted by companies including Amazon, Apple, and Allstate. Call us at (800) 747-3365 or fill out the form on the right to get several free quotes from shredders in your area, and start protecting your private information today.